Most Sensitive (1ppm) & Selective Photoacoustic Infrared Monitoring of Up to 6 Refrigerants in an Expandable Split Architecture System Design. 24 hour Refrigerant Leak Detection & Notification. 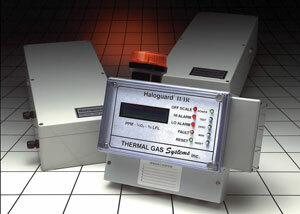 The HALOGUARD® II/IR combines microprocessor based controller with highly selective and sensitive remote photoacoutstic infrared modules to provide the most advanced system for detecting the presence of halocarbons. The multichannel controller monitors IR modules or 02 sensors in up to six separate locations, then provides both local and remote notification when gas concentration reaches preset alarm levels. Alarm relays and analog outputs are built in to activate remote devices or to interface with an energy management(EMS) or building automation (BMS) system. Relays for Hi & Low Alarm, Fault, and Offscale conditions can activate ventilation, dialer or remote notification. HALOGUARD® II/IR is guaranteed for one year from the date of shipment. Any device found defective in that period will be repaired or replaced free of charge. Read terms and conditions of sale for complete warranty information.